We arrived in Vienna after a long day of train travel from Krakow. It was the first time are passports were checked whilst taking the trains in Europe. The refugee situation between Eastern Europe and Austria had become quite tense. The security came on the train, checked our passports and our tickets and moved on. It was no big deal and certainly less trouble than airport security. Yet another reason why I like train travel. Our apartment was easy to find, and as we discovered, was in a great location for public transport to anywhere in Vienna. I spent the evening plotting out our activities in Vienna as I knew that there would be a lot to see on top of the Christmas Markets. I am also a big fan of the art of the Viennese Secession movement (started in 1897). So this visit we were going to focus on art and Christmas markets, plus whatever else we saw along the way. Vienna, for those who have not been before, is a stunningly beautiful city. Paris and Prague get all of the accolades, but I would easily put Vienna up there as a contender as well. While Vienna has a long history, it’s most beautiful and unique architecture is from the early 20th Century from the Art Nouveau and Viennese Secession/Art Deco movement. 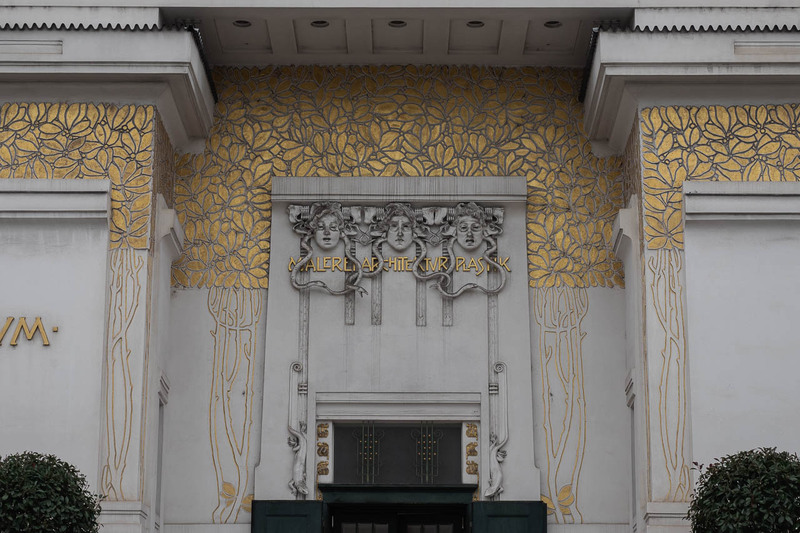 Our first stop in Vienna was the Secession House to see Gustav Klimt’s Beethoven Frieze. The museum did not allow photos to be taken, but you can see some images of the massive work if you follow the link. Klimt painted the frieze for the 14th Secessionist exhibit in 1901. His work was inspired by the composer Beethoven and illustrates man’s desire for happiness in an unhappy and treacherous world. We spent about an hour in the room and I could have spent longer if it weren’t for the fact that we were getting hungry for lunch. Above the front entrance of the Secession Building. 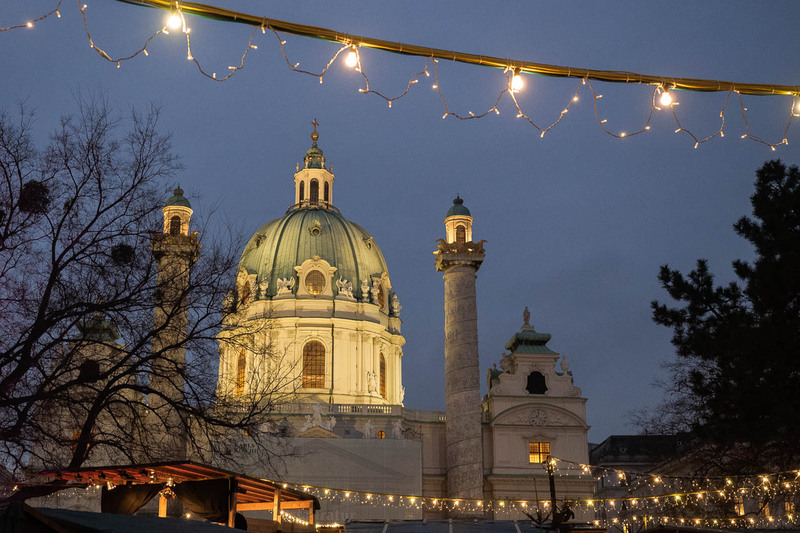 Vienna is a great city for dining. 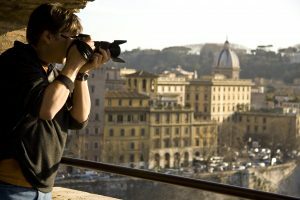 Of course it is known for its pastries that equal the French, but you can also get great street food, fine dining and bar fare. One of the best places to dine is at the Naschmarkt. This old market area has been a place for the Viennese to get their food since the 1600s. It is now a 1.5 km long market and restaurant area where you can get fresh produce, seafood, baked goods, as well as have a delicious meal at any one of the fantastic restaurants. Overall there are over 100 places to get food at the Naschmarkt, so you might need to visit more than once. 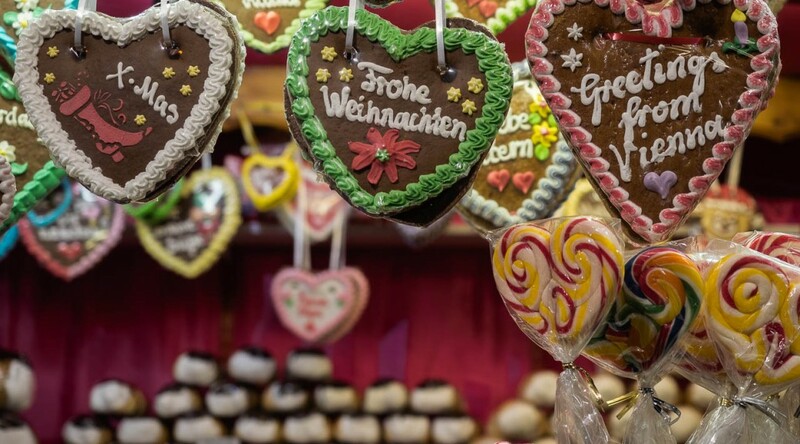 We left the Naschmarkt with our bellies full of delicious food and made our way over to Karlsplatz for our first Christmas Market. This market was in the park in front of the baroque masterpiece Vienna’s Karlskirche. Just inside the main entrance we stopped for the traditional glühwein. Matt says that it doesn’t matter where we are, he still doesn’t like it. But he drank it because it was getting dark and really cold outside. The market did not disappoint. Each of the markets in Vienna has a different theme or style. This one showcased the work of local artisans. 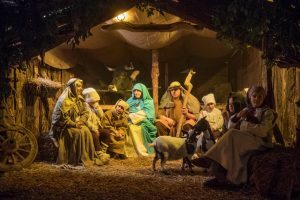 There was a blacksmith making wrought iron candle holders, bracelets and other decorative items, a candle maker, many jewelry makers, ornament makers, wood carvers, and of course glühwein sellers. Matt found a very cool carousel that was hand made and powered by bicycle. 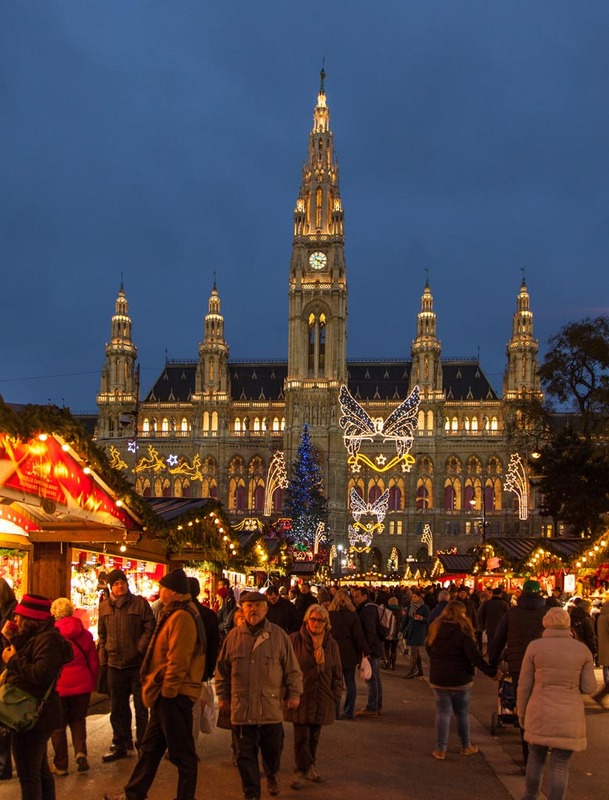 We then went to the Christmas market at Vienna’s Rathaus or city hall. The building itself is a gorgeous example of Neo-Gothic architecture from the 1870s. It and the park behind it were decorated for the holiday season and at night it was like something out of a fairy tale. We wandered around for a bit, but decided to return another night because the frigid wind had whipped up and we were freezing. 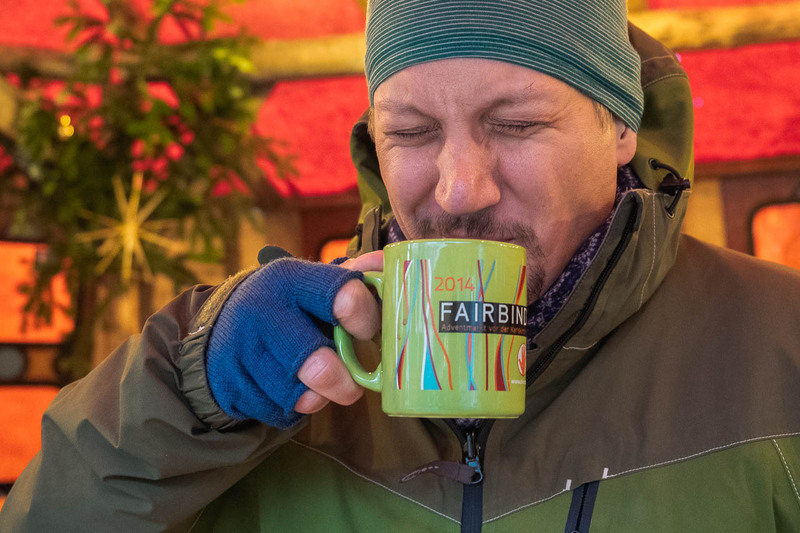 Over the next four days we toured several more Christmas Markets. There was a small one with nice ornaments and trinkets near St. Stephen’s Cathedral in Vienna’s main shopping district. We found a couple of others with work by local artists. The one at the Rathaus, while beautiful, mostly sold plastic toys, generic holiday decorations, and mass-produced cheap gifts. 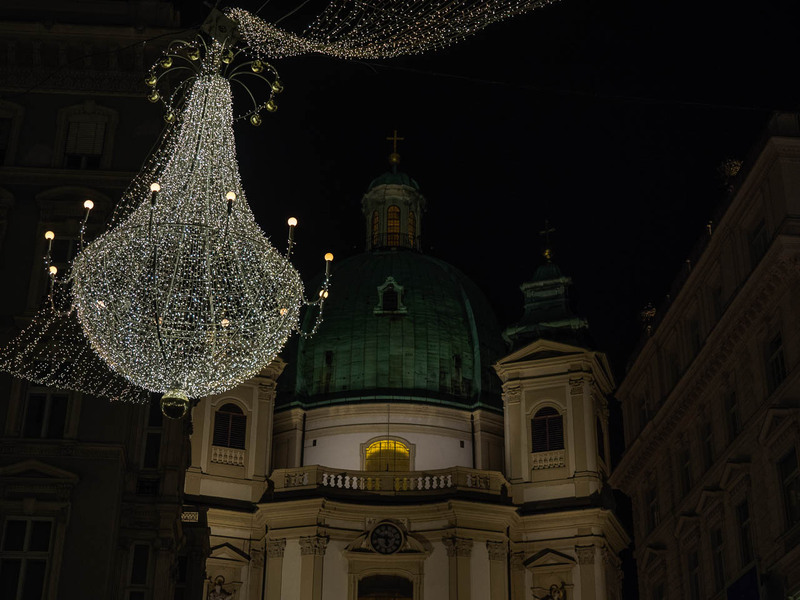 My two favorite markets both featured local artisans, the one nears Karlskirche and the market on the Freyung in central Vienna not too far from St. Stephen’s Platz, Vienna’s massive shopping district. The market on the Freyung also had local artisans, food makers, and was a nice and cozy alternative to the bigger market at the Rathaus. We also made our way over to Weiner Prater, the old public park and amusement park. 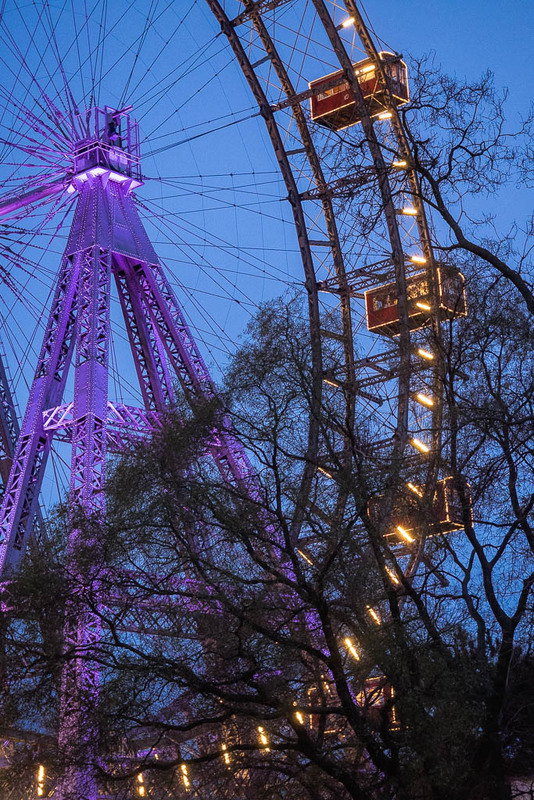 The park’s Reisenrad or ferris wheel has been part of Vienna’s skyline since 1897 and was featured in the James Bond movie The Living Daylights. That alone was the reason that I wanted to ride this historic ferris wheel. The design is similar to the London Eye in that you ride in a large enclosed car rather than sit two by two in seats in the open air. It gave us a nice view of Vienna and of course, there was a little Christmas market in the park that we had to visit. It wasn’t really anything special, but the scenery was nice for photos. One of the more disappointing markets, was the market at the Belvedere Palace. It was not terribly exciting, but then it had tough competition as it was dwarfed by the beautiful palace and the incredible artwork on display in the Leopold Gallery. The Leopold Gallery at the Belvedere Palace is where you can see some of Gustav Klimt’s most famous work, such as The Kiss. It was my first time seeing it in person. I would have thought that seeing it on coffee mugs, mouse pads, dorm room walls, beach towels, etc would have jaded me to the original, but there is nothing in the world like seeing the artwork in its original form. It was breathtaking. The details, his use of gold leaf and vivid and jewel-toned colors. It really is a masterpiece. 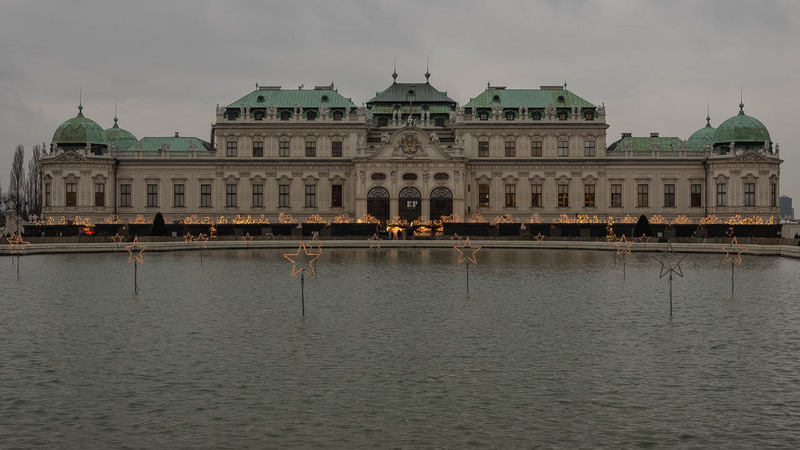 The Belvedere also houses a number of works by another favorite painter of mine, Egon Schiele. It was so wonderful to finally see his work in person. 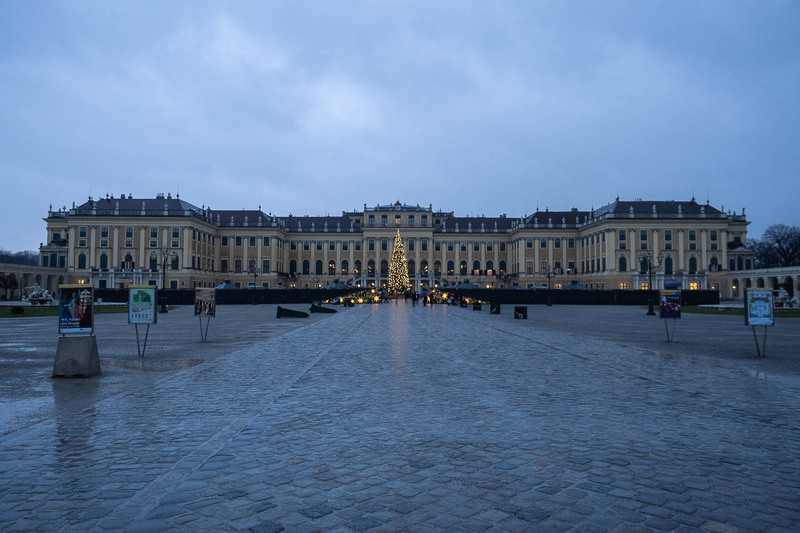 The palace itself is beautiful and we will have to return to Vienna when the gardens are in bloom. One area we enjoyed walking around was St. Stephen’s Platz. It is Vienna’s main shopping district and while we were not shopping, it was decorated for the holidays. The shop windows glistened against the rainy pavement. Lights shaped like grand chandeliers were strung overhead giving the already ritzy area an even greater feeling of luxury. St. Stephen’s Platz also has some of Vienna’s best known restaurants, such as the Zum Schwarzen Kamel, and bars, such as the Loos American Bar. This tiny bar, decorated in the art deco style by Adolf Loos has been a source of fantastic cocktails since 1908. The bartenders know their craft and can make pretty much anything you might need to help you relax after a day of shopping and sightseeing. Several cocktails later and Matt and I busted our budget for the day. Sometimes you have to splurge. Our final day in Vienna was spent at Schönbrunn Palace. We splurged for the audio guide, which was a good move because there is an awful lot of history to cover in this building. The audio guide at the Palace is great and much better than the one that we rented at Versailles. I left feeling like I learned even more about the Hapsburg Empire than I already knew. Unfortunately we couldn’t tour the grounds because it was pouring rain outside, despite the weatherman calling for sunshine all day. And the Christmas market out front was not open. So we left Vienna having missed out on one of the markets that was on my list. We also never made it to the Hundertwasserhaus. It’s good to leave something for next time.